The other day I was in a local dollar store and I felt like I hit gold!!! I found these adorable Halloween Wine Glasses for just $1 each, plus they had these “tube boxes” for just $1. Bingo–perfect Halloween gifts for my adult kiddo’s. Look how stinkin’ cute the glasses are. 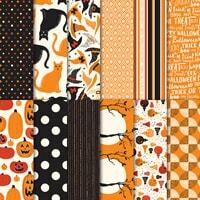 I did not like the containers “as is,” so I simply covered them with our Spooky Nights Designer Series Paper! I cut the paper to the height I needed–1 for the bottom and 1 piece for the top. I started by putting FAST FUSE along each of the side edges. 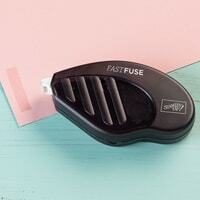 NOTE: FAST FUSE Buy 1 Get 2 Refills has SOLD OUT. BUT…..I have a SUBSTITUTION offer for you. Then I just stuck it down, rolled it carefully to keep it straight around the tube and adhered the end. It was super easy! Now my mind is spinning——I can do these for any gift, any holiday, any occasion………. Yikes–I better go buy more of these boxes! Here are the main Stampin’ Up! products I used. If you’d like to make these, and need to order anything, just click on any picture to go to the online store! As always, if you have questions, or I can help you with anything–JUST ASK! 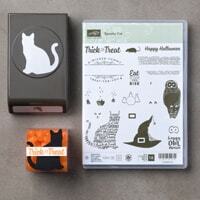 Enjoy the rest of your weekend and start getting your HALLOWEEN CRAFTY on! That store is so addicting!!!! Glad you love the containers!! !